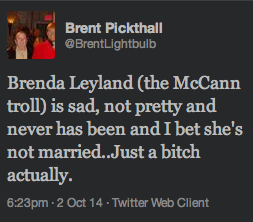 BY now you’ve have heard of Brenda Leyland. She’s an alleged ‘troll’ – someone who says things online. Lots of people say nasty things online, but the police don’t go after them all. Not all make it to the TV news or the front pages. Just some. 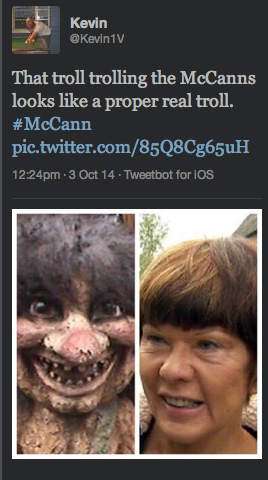 What she, allegedly, tweeted about the McCanns is unpleasant. But what are people saying about her? A churchgoing mother of two children has been uncovered as one of the internet “trolls” who bombarded the family of Madeleine McCann with vile abuse. 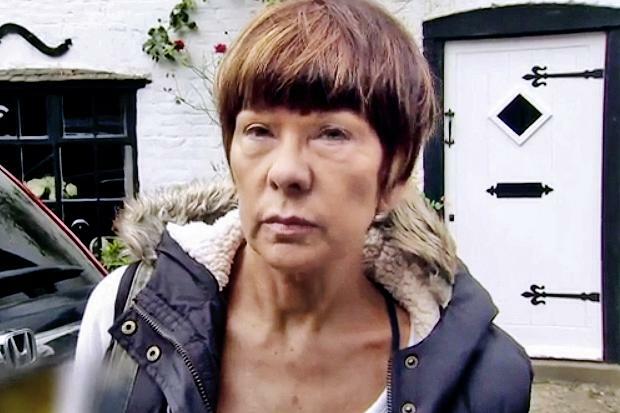 Brenda Leyland, 63, who lives in a picturesque village in Leicestershire, 15 miles from where Kate and Gerry McCann live with their two children, posted dozens of offensive messages about them. What things did she say? Using the Twitter handle Sweepyface, Mrs Leyland called for the McCanns to suffer “for the rest of their miserable lives”. And? No further examples are provided. But given the sort of thing that escapes censure online (calls for Emma West to be raped, “Let’s hunt Liam Stacey down”; Josie Cunnigham should be shot; and more) what we see there seems pretty mild. Within the bounds of the law, yes, you can say what you like. Unmasked, like Jihadi John or a master criminal. She seems reasonable. Cool, even. But that car’s planet killer. Tsk! The crime correspondent said he was later invited into Mrs Leyland’s house, where she told him she ‘had questions for the McCanns’ but ‘hoped she hadn’t broken the law’ by posting tweets in which she spread rumours about the McCanns’ marriage, and said she hoped they would suffer for ever. What law could she have broken with that aforesaid tweet? A spokesman for Scotland Yard said today: ‘We can confirm we have received a letter and documentation on 9 September which was passed to officers from Operation Grange [the police review into Madeleine’s disappearance].